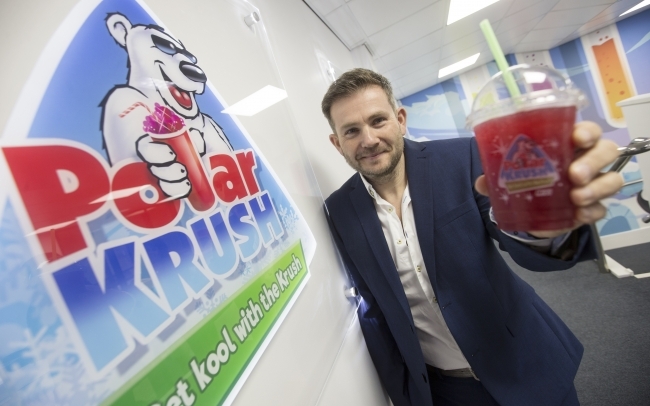 Iced-drinks company, Polar Krush have experienced unprecedented growth in the past twelve months and now the business is looking forward to another exciting year as they prepare for a full factory refit, recruitment drive and a variety of new product launches, including a sugar free option. The Polar Krush factory, based in Ashington, is currently undergoing a major factory refit which will enable the team to increase their output by 500 per cent. The new factory will be unveiled in June and will also welcome local school groups behind the scenes with the aim of helping local children to better understand how a large business works in a fun and engaging way. Established in 1998, the company has grown into a nationally recognisable family brand, loved by families both in the UK and overseas. Serving over 15 million cups each year in the UK alone, the company also supply machines and juice drinks to several countries around the world. Customers include cinemas, bowling alleys, leisure centres, ice rinks, food courts, holiday and theme parks, shopping centres, schools and independent retailers. The factory has created 20 new jobs for the North East in the past 2 years. The Polar Krush create their bold, eye-catching drinks range using natural colours and flavours The company is currently the only major manufacturer in the UK to use both natural flavouring and colours, while still achieving the fun, bright colours that families know and love. In 2016 Polar Krush saw a 62% increase in sales in the UK alone, coinciding with the reported rise in revenue across the leisure industry as more British families choose to ‘staycation’ rather than holiday abroad. Already a familiar brand in Europe, Polar Krush have also set their sights further afield with plans to expand into the Middle East within the next twelve months.